INDIANAPOLIS — January 23, 2018 — Zylo, the leading enterprise SaaS optimization platform, today announces completion of a $9.3 million Series A funding round. The round was led by Bessemer Venture Partners with participation from Salesforce Ventures and the Slack Fund. Repeat investors include High Alpha Capital, GGV, SV Angel, and Hyde Park Venture Partners. 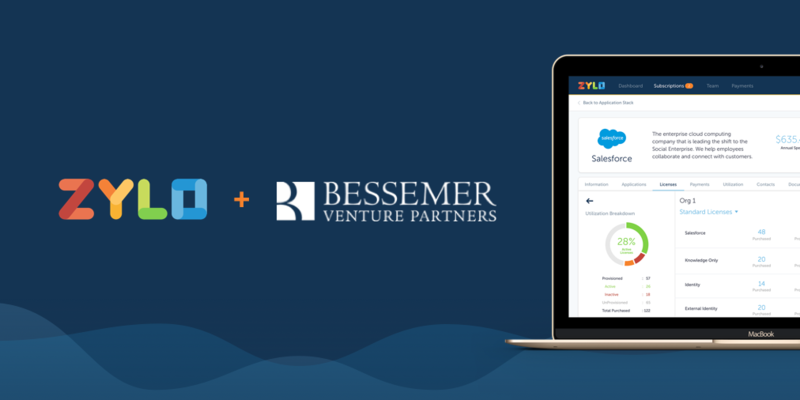 Byron Deeter of Bessemer Venture Partners will join Zylo’s Board of Directors. Byron directly led investments in seven cloud IPOs (SendGrid, Twilio, Instructure, Box, Criteo, Eloqua, and Cornerstone OnDemand) in the past six years, more than any other venture capitalist, and invested in numerous high-growth private cloud companies. The Zylo platform provides one system of record for all SaaS and cloud-based software used across a company, giving an organization visibility into what software is used, how much is spent and how to optimize their SaaS and cloud-based software investments. Zylo works with dozens of the largest enterprises around the world, including industry leaders in pharmaceutical, financial services, cloud consulting and technology sectors. The Zylo platform is managing over 1 million unique SaaS user licenses and more than $1 billion of annual SaaS subscription spend on behalf of its customers. Zylo will use the funds to significantly grow its entire team, with a priority on the customer success and engineering teams, as well as expand its platform, which provides transparency for the enterprise to discover all SaaS software applications, manage complex renewals, measure real-time utilization and optimize software licenses for every SaaS subscription in the organization. For more information on Zylo or a demo, visit zylo.com or follow @getzylo. Zylo is the leading enterprise SaaS optimization platform that transforms how companies manage and optimize their SaaS applications. By providing transparency of SaaS spend, user utilization and feedback, Zylo provides one SaaS system of record, empowering business leaders to discover, manage, measure and optimize their SaaS investments. Visit zylo.com or follow @getzylo for more information.